If you’re interested in maintaining your health and preventing illness, then you owe it to yourself to check out the work of Joe and Terry Graedon. Joe was trained as a pharmacologist at the University of Michigan, Theresa’s PhD is in Anthropology. Joe and Terry published their first book, People’s Pharmacy, in 1976, with a vision of providing people with high quality information for personal health and natural wellness. Through their books, their regular radio show and their many appearances on national television, they have managed to stay on the cutting edge even until now, with their current new release, Recipes and Remedies, which presents some most fascinating and useful information about ways you can treat common ailments and prevent serious illnesses through the use of common foods, spices, and other items you can find around the house. The famous physician, Hippocrates, is reported to have proclaimed, “Let food be your medicine.” Joe and Terry have taken this to heart. 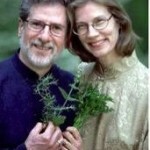 In this Healing Times conversation, we will get to know this colorful couple, and learn a few of their tips. For instance, did you know that some of the most troubling symptoms of Irritable Bowel Syndrome can be treated with, of all things, coconut macaroon cookies? In this conversation, we take a look at some of our new learnings about food – that food really can be our medicine – and the use of food as medicine is being avidly studied by institutions of the stature of Harvard and Stanford. institutions of the stature of Harvard and Stanford. How you can treat Type II diabetes with a vinegar dressing on your salad. The Graedons agree that – “you are what you eat and what you think.” As an example, we will discuss the latest on depression, now that clinical studies have shown that perhaps the vast majority of the $10 billion a year we spend on antidepressant medications is wasted on mild to moderate depressions. We will talk about a number of non-drug approaches you can use, and especially about some of the foods you can eat to help you Escape From Depression. In 1976, when The People’s Pharmacy® was originally published, it was one of the first books providing drug and health information to consumers. It went on to become a number one bestseller. Since then, Joe and Terry Graedon have gone on to write 14 additional books, one of which was a medical thriller co-authored with Tom Ferguson, MD (No Deadly Drug, Pocket Books, 1992). In addition, they write The People’s Pharmacy® syndicated newspaper column, distributed by King Features®, co-host an award-winning health talk show on public radio, and speak frequently on health issues. Learn more about the People’s Pharmacy and how it started.